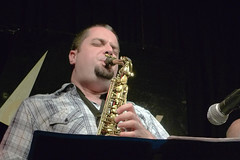 In 2007, Marek Winiarski, who runs the Polish jazz label Not Two, invited Ken Vandermark to Krakow to record a large-scale project. The eternally deadline-pressed Vandermark was offered the irresistible opportunity to spend a full week writing for this hand-picked 11-piece band. The personnel of Denmark’s New Jungle Orchestra has changed during its 30-plus years together, and so have its creative outposts. Having traveled to such places as the Middle East and China for inspiration, the NJO recently booked passage on the Trivandrum Express for its latest recording, Sketches of India. Imagine idolizing a musician as a teenager and not only getting to play with that musician years later, but also forging a close association with him. In 1996, Vandermark brought McPhee to the Empty Bottle for his first-ever performance in Chicago. The rest is history. Keeping up with Ken Vandermark’s new bands is a little like keeping up with the Chicago weather: Turn your head and you may miss a new development. The Made for Break Quartet is one of his most far-reaching projects. Few contemporary artists are doing as much to advance the art of the saxophone-drum duo as Artist in Residence Ken Vandermark, whose trap set opposites have included British great Paul Lytton, Chicago ace Tim Daisy and Paal Nilssen-Love, a hard-hitting Norwegian with impeccable credentials. Okay, time to take a special jazz festival listener’s poll. Name your favorite bass clarinetist who leads his own band and has a terrific album to show for it. There’s a catch: It can’t be someone who doubles on the instrument. It has to be a full-time bass clarinetist. The top voter-getter (and, OK, the only vote-getter) is Chicago’s own Jason Stein. Saxophonist and composer Ken Vandermark as its Artist in Residence for this year’s festival. The Chicago Jazz Festival exclusively names Chicago artists for its Artist in Residence program, now in its tenth year, commissioning large-scale compositions and presenting multiple performance opportunities over the course of the four day festival. Tickets: Free. For more info, call 347.294.4759. 6/29: 7:00pm: Jeffrey Shurdut. 8:00pm: Lukas Ligeti Quintet: Thomas Bergeron (trumpet), Travis Sullivan (sax), Shoko Nagai (piano), Evan Lipson (bass), Lukas Ligeti (drums). 9:00pm: Kenny Jaworski. 7/13: 7:00pm: SoSaLa featuring Sohrab Saadat Ladjevardi. 8:00pm: Louie Belogenis + Lukas Ligeti. 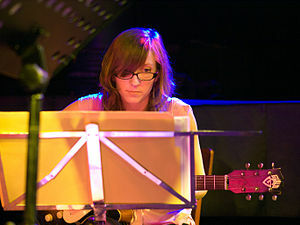 7/20: 7:15pm: Hypercolor – Eyal Maoz (guitar), James Ilgenfritz (bass), Lukas Ligeti (drums). Just off a 3-month long tour in Europe and India, composer/percussionist Lukas Ligeti returns to his hometown of New York City with live performances ranging from avant-jazz collaborations to a curatorial concert series in Brooklyn. One of the most innovative composers and improvisers on the new music scene, Lukas neatly bridges the classical-modernist-world-music divide. 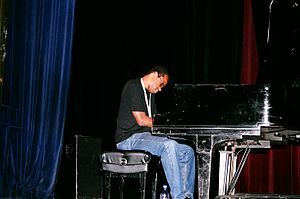 He combines his post-minimalism compositional style with other facets of contemporary expressions such as noise and electronics as well as indigenous non-Western musical and cultural influences.